I have had this album a while, and it was only thanks to a Facebook friend raving about it that I remembered it, and it was a darn good thing I did, I can tell you. Formed in Rome in 2001 as a ’70s-centric prog covers band, La Bocca della Verità (The Mouth of Truth, so named after an ancient marble mask located in the Roman capital) have finally released their own work, a sprawling science fiction concept album that starts in the year 2161 and presumably tells the story of the planet Avenoth. I say presumably as, being a linguistically-challenged Brit, I can only get a gist of what the story is about as no English translations are offered, and quite right too. The “booklet” is in the form of a decent sized fold-out poster that anyone like me who struggles to get maps to fold up the right way will have minutes of fun vainly attempting to get it to fit back into the slot in the lavishly designed tri-fold cover. Although the lyrics, sung in his gravelly tones by Fabrizio Marziani and ably abetted by the rest of the band’s backing vocals, are no doubt important, for me they will have to remain in the “voices as instrument” category, and in any event they do not dominate proceedings, allowing plenty of long instrumental passages to hold one’s attention. 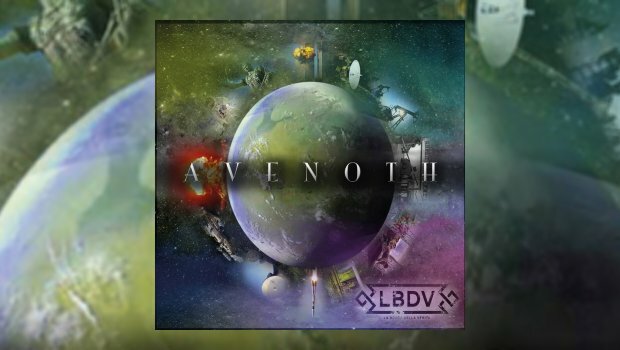 There are four tracks over ten minutes on Avenoth, and three more over six minutes. Although all the music is superbly executed, it may have been better to have made this a double CD, with two discs of traditional album length, as it does get a bit wearing listening to all of it in one sitting. I suppose having no doubt written all this music over a long period of time, when given the chance the band just wanted it all out there, but maybe the judicious split into two discs, production costs aside, would have been a good idea. The first of the long tracks is in my opinion the weakest, as the band throw everything including the kitchen sink at La Suite Dei Tre Planeti, and it is slightly incoherent as a result. It’s one of those long tracks I struggle to recall anything about once it’s over, bar Roberto Bucci’s superb Mick Box-like solo. However, perseverance pays off as from the title track onwards the album finds its mojo and doesn’t let up, apart from the respite granted by the soft hearted, gorgeously filmic and hymnal Perduto Avenoth, simply the loveliest thing I have heard this year. The bombastic Hammond, swirling and occasionally cheesy synths, thunderous rhythms, and soaring guitar make me think that had Uriah Heep in their early ’70s prime been an Italian band, their brand of Rock Progressivo Italiana would have sounded a lot like La Bocca della Verità. This is not a bad thing, and when you add in a Rickenbacker bass guitar, a dash of PFM, Banco, and Genesis to the mix a heady ’70s brew is the result. With Avenoth, this fine band of proud-to-be-regressive rockers have shaken and stirred a near 80 minute highly enjoyable cocktail of pompous and deliciously overblown ingredients into a fizzing whole that explodes in your ears, an experience that only the most witheringly cynical could fail to appreciate. In fact, if La Deportazione degli Avenothiani and the following La Rivolta – Il Massacro dei Terrestri do not make you want to turn it up to 11, there’s something missing from your soul.